My problem with making pies is making sure my pie crust dough is fully cooked and crisp on the bottom. There's nothing worse than a pie that's underdone or has a soggy crust. Thankfully, this recipe is a foolproof pie to ensure the crust maintains a crispy texture while the filling is fully cooked. The secret is finishing the components separately and then assembling them before serving. In this recipe, the pie crust is baked until golden brown first. Meanwhile, the combination of Granny Smith and McIntosh apples are cooked over the stovetop just until the McIntosh apples start to soften. The cooked apple mixture will release a lot of liquid (which is mainly from the McIntosh apples) so it must be drained to prevent too much liquid to get into the pie. The drained liquid is combined with heavy cream and brought to a boil to thicken up. As the juices thicken, the streusel is made and baked for a few minutes to brown. 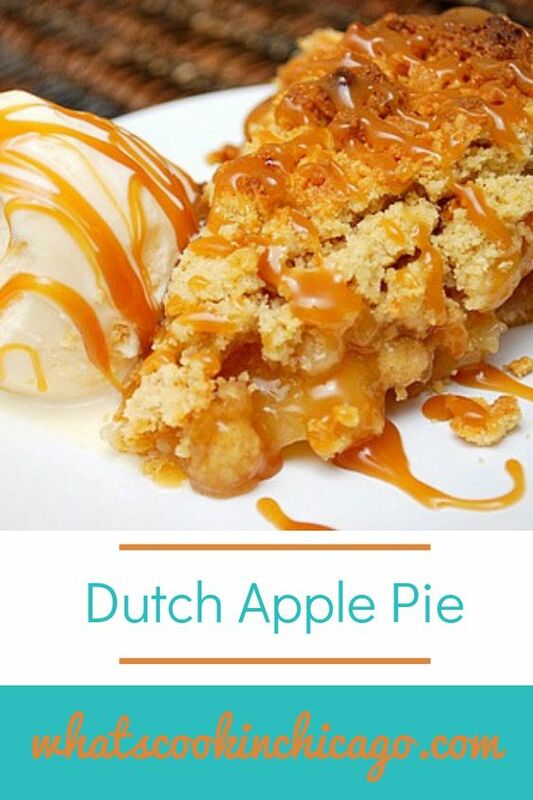 The cooked apples are transferred into the baked pie shell, the thickened apple juices are poured over the apples and the par-baked streusel is sprinkled on top for that unmistakable Dutch topping. This gets popped into the oven for 10 minutes just until the pie gets nice and brown. Phew. It seems like a lot of steps to prepare but in essence, the total bake time for this pie is less than an hour... with the crust taking the most time by baking for up to 40 minutes. After assembling, the pie bakes for another 10 minutes and that's it! Besides, this recipe ensures a nice crispy crust, cooked filling and a crunchy topping. 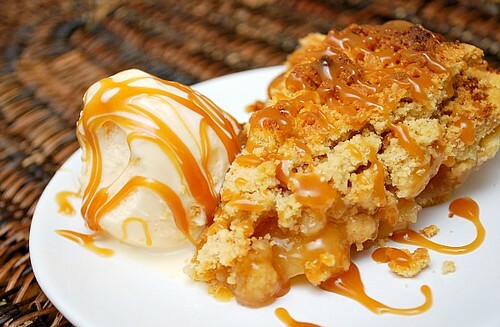 To put it over the top, I suggest serving it a la mode with vanilla ice cream and a drizzle of caramel. Enjoy! Prepare a 9 inch pie plate placing the pie dough in the center of the plate, easing dough into pan corners by gently lifting dough edges with one hand while pressing around pan bottom with other hand. Trim dough edges to extend about 1/2-inch beyond rim of pan. Fold overhang under itself; flute dough as desired, refrigerate or freeze dough-lined pie plate until firm, about 1 hour in refrigerator or 30 minutes in freezer. Adjust oven rack to lower-middle position and heat oven to 425 degrees. Remove dough-lined pie plate from refrigerator or freezer and press doubled 12-inch piece heavy-duty foil inside pie shell and fold edges of foil to shield fluted edge; distribute 2 cups ceramic or metal pie weights over foil. Bake, leaving foil and weights in place until dough looks dry and is light in color, 20 to 25 minutes. Carefully remove foil and weights by gathering corners of foil and pulling up and out. Continue to bake until pie shell is golden brown, 10 to 15 minutes longer. Remove from oven. For the apple filling: Peel, quarter, and core apples; slice each quarter crosswise into pieces 1/4-inch thick. Toss apples, sugar, cinnamon, and salt in large bowl to combine. Heat butter in large Dutch oven over high heat until foaming subsides; add apples and toss to coat. Reduce heat to medium-high and cook, covered, stirring occasionally, until apples are softened, about 5 minutes. Stir in raisins; cook, covered, stirring occasionally, until Granny Smith apple slices are tender and McIntosh apple slices are softened and beginning to break down, about 5 minutes longer. Set large colander over large bowl; transfer cooked apples to colander. Shake colander and toss apples to drain off as much juice as possible. Bring drained juice and cream to boil in now-empty Dutch oven over high heat; cook, stirring occasionally, until thickened and wooden spoon leaves trail in mixture, about 5 minutes. Transfer apples to prebaked pie shell; pour reduced juice mixture over and smooth with rubber spatula. For the streusel topping: Combine flour, sugars, and cornmeal in medium bowl; drizzle with melted butter and toss with fork until evenly moistened and mixture forms many large chunks with pea-sized pieces mixed throughout. Line rimmed baking sheet with parchment paper and spread streusel in even layer on baking sheet. Bake streusel until golden brown, about 5 minutes; cool baking sheet with streusel on wire rack until cool enough to handle, about 5 minutes. Sprinkle streusel evenly over pie filling. Set pie plate on now-empty baking sheet and bake until streusel topping is deep golden brown, about 10 minutes. Cool on wire rack and serve. This looks to die for...I'm drooling all over my keyboard right now. I just love apple pies and this one looks absolutely delicious. I'm planning to make it for this weekend. oh my. that looks so crumbly and amazing! oh jeez. We have a variation of a similar apple pie recipe on our website. I look forward to trying this version. Thanks for posting it. Hmm never seen that recipe before and I'm Dutch ;-).